10 Elite Mac Apps For Pennies on The Dollar! Hook up Your Mac With 10 Elite Mac Apps! The bundle includes 10 HIGH-QUALITY Mac apps valued at over $390 for an EXCLUSIVE price of $50! This all-inclusive bundle has just about something for everyone. Roxio Toast 11 ($100) - Titanium makes it easier than ever to capture, burn, convert, copy and share digital media. Set for iWork ($69) - Over 1100 unique designs for Pages, 100 spreadsheet templates for Numbers, 50 first-class slideshow themes for Keynote, and 1300 images for illustrating your content. All templates are available in the US and international paper sizes. LaunchBar ($35) - Get instant access to applications, documents, contacts, calendars, bookmarks, media libraries, search engines and so much more – just by typing short abbreviations. TasksBox ($25) - TasksBox is a simple and beautiful task manager that helps you to easily manage your daily tasks so that you can spend more time on what you love. Animationist ($30) - Create perfect title art animations for your YouTube videos, iMovie or Final Cut projects, showcase videos and even TV broadcasts. iFinance ($30) - Start recording your income and expenses right now, be it a coffee during lunch break or a brand new car - finally, you'll get a clear overview of what exactly you spend your money on. Habits ($20) - Habits is based on the scientifically proven principle that it takes a continuous chain or repetition of an activity to create a new habit, make a habit out of a resolution or replace an existing habit with a new one. MainMenu Pro ($10) - Run daily, weekly and monthly maintenance scripts to keep your Mac strong. Corel Paint it! ($40) - This photo painting software includes multiple painting styles, brushes and realistic effects that let you add a personal touch to any creative project. Stationery Pack 2 ($25) - Turn your favorite photos into greeting cards and send them with Mail. Plus a BONUS App if You Buy Right Now! That's right, if you buy this bundle RIGHT NOW, you'll also get Trickster as an added bonus! Trickster ($10) - Trickster is the ultimate productivity booster for you. This bundle has been hand-picked to ensure that quality apps make it onto your desktop. 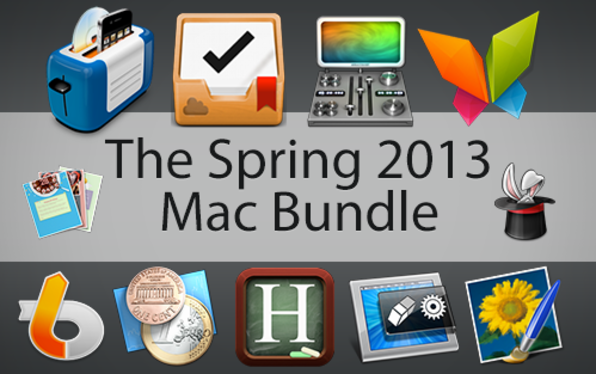 There's no better opportunity to start enhancing your Mac that with this Spring 2013 Bundle. Enjoy!